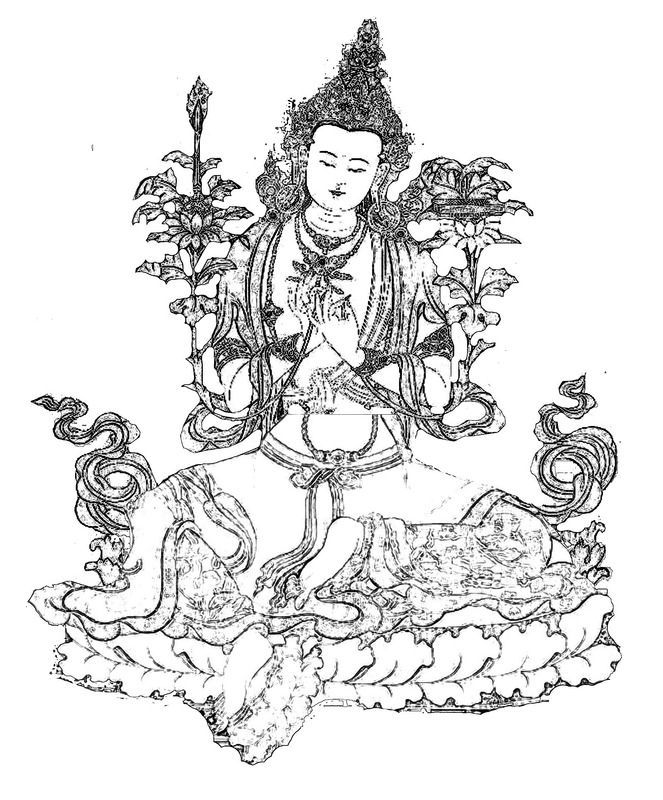 Manjushri first appears in Buddhist literature in Mahayana sutras, in particular the Lotus Sutra, the Flower Ornament Sutra, and the Vimalakirti Sutra as as well as the Prajna Paramamita Sutra. (The Prajna Paramitata is actually a large collection of sutras that includes the Heart and Diamond Sutras.) He was popular in India by no later than the 4th century, and by the 5th or 6th century he had become one of the major figures of Mahayana iconography. Although Manjushri does not appear in the Pali Canon, some scholars associate him with Pancasikha, a heavenly musician who appears in the Digha-nikaya of the Pali Canon. Manjushri’s likeness is often found in Zen meditation halls, and he is an important deity in Tibetan tantra. Along with wisdom, Manjushri is associated with poetry, oratory and writing. He is said to have an especially melodious voice. Manjushri is a Bodhisattva who represents wisdom, and his mantra also symbolizes that quality. He holds a sword in his right hand — symbolizing his ability to cut through delusion. In his left hand, by his heart, he holds the stem of a lotus flower, which bears a book — the Perfection of Wisdom teaching. blog fonts are being changed to suit the new theme.. thank you.